Leading Manufacturer of schneider electric hmi touch panel, schneider hmi, delta hmi and siemens hmi panels from Ahmedabad. 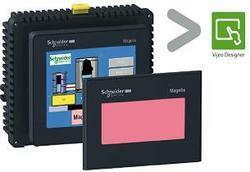 Schneider Electric's Small Panels range has been revamped with an emphasis on technological innovation. More open, more communicating, more compact, Magelis STO and STU panels are ideal for machine manufacturer solutions in industry and infrastructures: touch screens, clever mounting, free software, application downloading via USB memory stick. 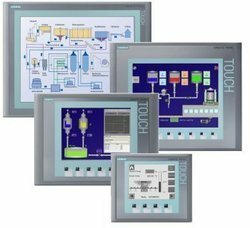 The user-friendly design, ease of installation and use, configuration using a unique familiar software program, simplified diagnostics and maintenance, all contribute to reducing the overall cost of your HMI solution. Magelis STO and STU panels can be mounted without tools! “Spring clip” technology has proved its worth, but Schneider Electric has now introduced the 22 diameter “pushbutton” mounting system for the Magelis STU. Simply press to mount your product directly onto the machine frame or in an enclosure, with a single standard Ø 22 cut-out. It couldn’t be simpler! Configuration using the unique software program for Schneider Electric's HMI range, Vijeo Designer, is an undeniable bonus with this offer, giving you the benefit of the most advanced functions: Web Gate, Recipes, and library of graphic objects. With an Ethernet connection embedded as standard, communication is now more open and faster with the Magelis STU. In addition multi-protocol RS485/232 standard RJ45 ports, as well as USB ports, make it easier to communicate with commercially-available equipment on both models, without extra cost. Offered EXOR HMI Touch Panel is designed and developed as per the industry requisites, resulting in a flawless design. Our customers can purchase these products at market leading prices with the assurance of hassle-free maintenance & long-term services. The unique characteristic features of this product include brilliant displays with LED technology and readability under sunlight. We make deliveries of these products with promised specifications and within the proper time frame to cater to the variegated needs of our valued customers. Being a reckoned name in industry, we are offering Delta Human Machine Interface, as per global industrial requisites & norms. Human machine interface is a medium for information exchange and mutual communication that has to be established between electromechanical systems and the users. It allows the user to complete settings through touchable images or keys on a user-friendly window. We with our vision to fulfill the industrial needs of our valued clients, develop and design these products precisely using our expertise. We deliver these products at minimal prices. Siemens HMI Panel has been designed and offered to our valued customers, backed by technologically advanced working procedure. With salient features like reliable & ergonomic operations and brilliant displays for excellent readability, these products are precisely designed & offered to our valued customers. Our clients can operate these panels by means of touch screens or key pads. These HMI panels can be purchased at reasonable rates, for their uses in all forms of access applications.